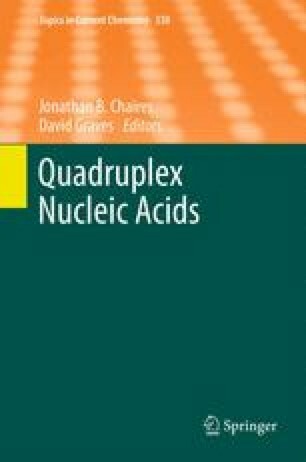 Guanine quadruplexes (G4) are unusual four-stranded nucleic acid structures formed by G-rich DNA/RNA. Beyond their likely biological relevance, the self-assembly, stability, and rigidity of these structures are also interesting for nanotechnology and biotechnology applications. Therefore, efforts are carried out to understand the rules that govern stability and folding of G-quadruplexes. We focus this chapter on tetramolecular conformations which are simple tractable models. We report here the experimental parameters, molecules, and modifications that affect thermal stability and/or association kinetics of these structures. Some chemical modifications which facilitate tetramolecular quadruplex formation and can be useful for nano- or biotechnology are also described. This work has been supported by ANR (QuantADN, F-DNA and G4-Toolbox), Conseil Régional d’Aquitaine, ARC and FRM. We would like to thank all our collaborators, past and present, for helpful discussions.